For a broader coverage of this topic, see metre. A centimetre (international spelling as used by the International Bureau of Weights and Measures; symbol cm) or centimeter (American spelling) is a unit of length in the metric system, equal to one hundredth of a metre, centi being the SI prefix for a factor of 1/100. The centimetre was the base unit of length in the now deprecated centimetre–gram–second (CGS) system of units. The International Bureau of Weights and Measures is an intergovernmental organization that was established by the Metre Convention, through which member states act together on matters related to measurement science and measurement standards. The organisation is usually referred to by its French initialism, BIPM. The BIPM's headquarters is based at Sèvres, France. It has custody of the International Prototype of the Kilogram and houses the secretariat for this organization as well as hosting its formal meetings. Capacitance is the ratio of the change in an electric charge in a system to the corresponding change in its electric potential. There are two closely related notions of capacitance: self capacitance and mutual capacitance. Any object that can be electrically charged exhibits self capacitance. A material with a large self capacitance holds more electric charge at a given voltage than one with low capacitance. 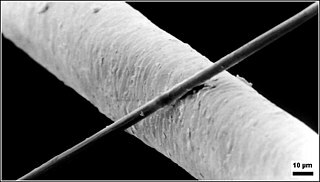 The notion of mutual capacitance is particularly important for understanding the operations of the capacitor, one of the three elementary linear electronic components. The centimetre–gram–second system of units is a variant of the metric system based on the centimetre as the unit of length, the gram as the unit of mass, and the second as the unit of time. All CGS mechanical units are unambiguously derived from these three base units, but there are several different ways of extending the CGS system to cover electromagnetism. A metric prefix is a unit prefix that precedes a basic unit of measure to indicate a multiple or fraction of the unit. While all metric prefixes in common use today are decadic, historically there have been a number of binary metric prefixes as well. Each prefix has a unique symbol that is prepended to the unit symbol. 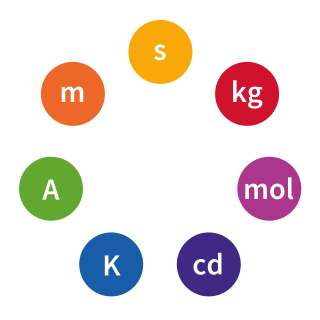 The prefix kilo-, for example, may be added to gram to indicate multiplication by one thousand: one kilogram is equal to one thousand grams. 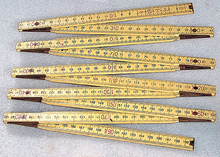 The prefix milli-, likewise, may be added to metre to indicate division by one thousand; one millimetre is equal to one thousandth of a metre. The pascal is the SI derived unit of pressure used to quantify internal pressure, stress, Young's modulus and ultimate tensile strength. It is defined as one newton per square metre. It is named after the French polymath Blaise Pascal. The square metre or square meter is the SI derived unit of area with symbol m2. In the physical sciences, the wavenumber is the spatial frequency of a wave, measured in cycles per unit distance or radians per unit distance. Whereas temporal frequency can be thought of as the number of waves per unit time, wavenumber is the number of waves per unit distance. Nano- is a unit prefix meaning "one billionth". Used primarily with the metric system, this prefix denotes a factor of 10−9 or 0.000000001. It is frequently encountered in science and electronics for prefixing units of time and length. A decametre or dekameter is a very rarely used unit of length in the metric system equal to ten metres. The ohm is the SI derived unit of electrical resistance, named after German physicist Georg Simon Ohm. Although several empirically derived standard units for expressing electrical resistance were developed in connection with early telegraphy practice, the British Association for the Advancement of Science proposed a unit derived from existing units of mass, length and time and of a convenient size for practical work as early as 1861. The definition of the ohm was revised several times. Today, the definition of the ohm is expressed from the quantum Hall effect. The cubic metre or cubic meter is the SI derived unit of volume. Its SI symbol is m3. 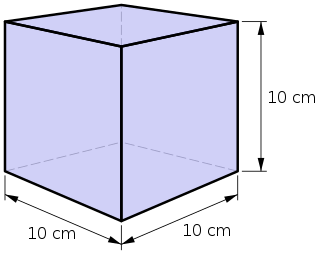 It is the volume of a cube with edges one metre in length. An alternative name, which allowed a different usage with metric prefixes, was the stère, still sometimes used for dry measure. Another alternative name, no longer widely used, was the kilolitre. A coherent system of units is a system of units based on a system of quantities in such a way that the equations between the numerical values expressed in the units of the system have exactly the same form, including numerical factors, as the corresponding equations between the quantities. Equivalently, it is a system in which every quantity has a unique unit, or one that does not use conversion factors. ↑ "Decimal multiples and submultiples of SI units". Bureau International des Poids et Mesures. 2014. Retrieved 5 July 2015. ↑ CJK Compatibility excerpt from The Unicode Standard, Version 10.0.